Consider how crazy it is that there was once a time when simply wearing blue jeans made you a rebel. Forget crazy hair and piercings, back then all you needed were a pair of raw denim Levis, rolled-up t-shirt sleeves, and enough coin for a couple root beer floats and you were totally getting necked in the back of your dad's Chrysler Saratoga. These days your boss buys blue jeans at JC Penney specifically for casual Friday. [I found this old photograph at a local bookstore. 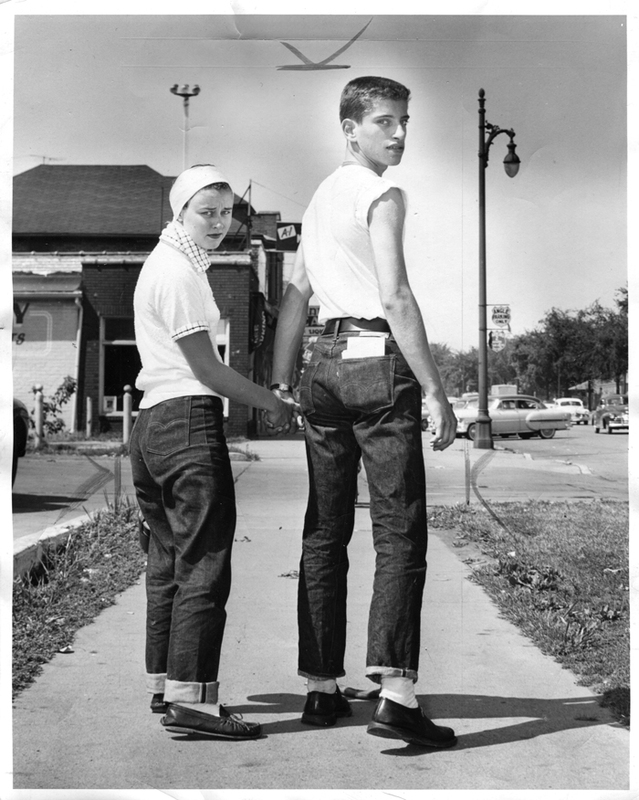 It was taken July 20, 1954 by a newspaper photographer and the notes suggest it was for a story about teenagers and the "new trend" of wearing blue jeans to school. Blue jeans were controversial that year, after an army colonel on a base in Frankfurt, Germany banned military wives from wearing blue jeans, claiming they reflected poorly on the United States. Four years later Levi's would be chosen as a highlight of the American Pavilion at the World's Fair in Belgium. The young lady in this photo (Miss Pauline Goodrich, 18, of Alanson, Michigan) was wearing men's jeans with her man (Louis Milot, 16) when they were spotted on the street in Milot's hometown of Wyandotte, Michigan.